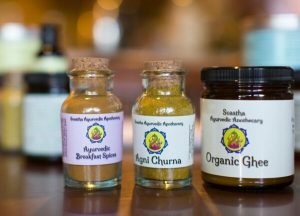 Ayurveda is an age-old science based on traditional holistic medicine from India. 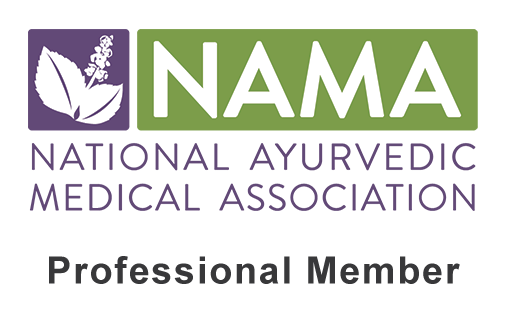 With more individuals seeking out natural treatment options, Ayurveda is slowly making its way into our mainstream society here in the West. Although the overall theory of Ayurveda seems easy enough, it can be quite complicated and overwhelming, especially in the beginning. If you are looking to welcome an Ayurvedic diet or lifestyle into your daily life but do not know where to begin, here is a guide that will allow you to transition into this healing journey smoothly and with ease! The best thing to do when starting to incorporate an Ayurvedic lifestyle is to keep it simple by utilizing the basic principles of this ancient wisdom. Although one can name numerous principles of Ayurveda, here are the main ones to focus on. 1. The three dosha types and their specific needs. 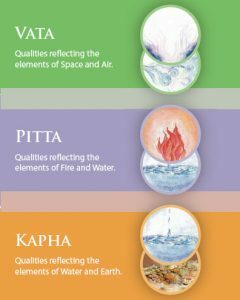 Ayurveda is based on the three main body types, often called doshas or bodily humors (spec Vata, Pitta, Kapha), and finding a balance between these unique energetic forces. The ratio of these three doshas in one’s body makes up their personal constitution (sometimes called Ayurvedic body type or Prakriti) and will help to shed light on the best foods, herbs and general activities for that individual. For example, a Vata type is often restless in mind and body and may need more grounding foods and activities in order to find a sense of balance and stability. Alternatively a Kapha type is often more slow and sedentary by nature and will need more lightening foods and increased mobility in order to avoid sluggishness and lethargy. The knowledge of these three body types and our personal constitution reveals to us the theory that what is healing for one individual, may be harming to another. This is one of the most essential and vital aspects of Ayurveda! Each individual is unique and therefore will require specialized, individual treatment in order to find balance. One man’s medicine may be another man’s poison! Read more on “What is a Dosha?” here. 2. Finding balance through the 20 qualities of Ayurveda. According to Ayurveda, there are 20 main qualities (called gunas in Sanskrit) to look out for when preventing or treating imbalance. Each single quality has an opposing quality, so they are sometimes referred to as the 10 pairs of opposites. Knowing these 20 gunas, one can see which quality is out of balance at any given time and restore balance in their system by increasing its opposite force. For example, if one has too much heaviness in their system, then they should increase its opposing quality of lightness in there daily diet and activities. Similarly, if one has too much heat, they should welcome in more cooling foods, herbs and practices. Equally as important will be to avoid substances and activities that are similar in quality and therefore will increase their imbalance. Using this last example of excessive heat, one should avoid heating foods and activities, as they will increase the already provoked heat in the system. To put it even more basically, “like increases like” and “opposing qualities balance each other out”. Click here for a full chart on the 20 qualities of Ayurveda. Whenever treating a patient of any kind in Ayurveda, the first step is always to treat their digestive fire (called Agni). This is because each and every disorder stems from some sort of digestive imbalance. Therefore a healthy digestive fire equals a healthy body and mind (and vice versa). In order to prevent imbalance or treat disease of any kind, one must always look first at the digestion. With this in mind, if one wishes to adopt an Ayurvedic lifestyle, it must be geared toward strengthening the digestive fire and removing any accumulated toxins in the system. Without this essential factor, there cannot be true balance and health! Read more on the importance of digestion here. 4. Perfect health includes a healthy body, mind and spirit. Although physical health is often what we are in search of, in Ayurveda it is well known that one cannot obtain svastha (perfect health) without balance of the body, mind and spirit. In fact, it is said that 99% of all disease and disorders stem from a mental origin. Therefore when looking to obtain balance through Ayurveda, we must also look into the health of our thoughts, mind and emotions. Click here to discover ways to Detox the Mind. With these four essential philosophies to consider, here are some simple guidelines to begin with. Please keep in mind that Ayurveda is all about slow and steady. Therefore when you are first getting started, it will be best to adopt these guidelines one at a time and continue to make the necessary changes with patience, awareness and ease. 1. Know your Ayurvedic body type. Since Ayurvedic medicine is based largely on the three doshas, discovering which is your predominant dosha is a vital necessity if you wish to adopt an Ayurvedic diet and lifestyle. For some individuals, this will be fairly obvious to discover. However, it is equally as common to resonate with multiple doshas, making the answer a bit more complex. In fact, it is possible to have 2 doshas be equally as strong in your constitution (I personally am predominantly Vata and Pitta). To begin with, one can take an online dosha quiz as a rough guideline for what their body type may be. Like any online quiz, this is just a simple guideline and may not give you an accurate reading. If you feel like you need a more definitive answer, it would be best to receive an individualized Ayurvedic consultation in order to establish this more accurately. Click here for tips on how to take our Dosha quiz for the most accurate results. Take our “Discover your Dosha Quiz” here! Once you discover your body type, you can then read on to find out the best diet and lifestyle practices to go by. For example, Pitta types will want to avoid heating foods such as cayenne pepper, spicy food and fatty fried foods, as well as avoid heating practices such as exercising mid-day in the direct sun. 2. Incorporate simple steps to start an Ayurvedic diet. Whether you know your dosha type or not, you can begin to adopt some of the basic Ayurvedic food principles into your daily life. You do not need to be vegan, vegetarian, gluten-free or follow any other specified diet, as the main principles are based on how we eat as well as what we are eating. In fact even a cookie can be considered Ayurvedic when it is made and eaten in the right context (click here for our Ayurvedic Chocolate Chip Cookie recipe!). To avoid becoming overwhelmed with the multitude of rules that make up an Ayurvedic diet, here are some of the most important ones to welcome. Once you transition into these new habits and make them a natural part of your daily life, then you can begin to create more changes as time goes on. However, making too many changes at once can often lead to burnout, resentment and frustration and rarely ever leads to longterm changes. Eat home-cooked meals using whole foods while avoiding processed food, refined food and additives (click here for some healthy recipe ideas). Eat on a healthy, consistent meal schedule; do not skip meals. Eat your largest meal mid-day; make dinner your lightest meal. Take a digestive aid before meals (click here for our digestive appetizer recipe). Sip on hot water between meals. Following simple rules such as these on a regular basis will help to increase your digestive fire, creating more health and balance in your whole being. Discover 9 basic Ayurvedic dietary guidelines here. 3. Begin to create routine in your daily life. Create a healthy sleep schedule being asleep by 10pm and awake by 6am. Create a healthy meal schedule eating breakfast around 7am, lunch around 12pm and dinner by 6pm (no later!). Begin each morning by scraping the tongue and drinking a hot cup of lemon water. End each evening with a 10 minute mediation or 15 minutes of restorative Yoga. Click here for a full chart on the Ayurvedic Daily Routine. 4. Make meditation, Yoga or simple breathing techniques a daily practice. Since Ayurveda considers perfect health (svastha) to include the balance of the mind, body and consciousness, we must look further than our physical body to establish true health. The most powerful way to heal our mind and consciousness is through a daily practice of either gentle Yoga, meditation and/or pranayama (breathing techniques). Perform 10 slow-paced sun salutations each morning. Take 5 minutes to sit in mediation each morning, and again before bed. Sitting comfortably, take 10-15 deep belly breaths each morning, mid-day and again before bed. This number can be increased overtime. Sitting comfortably perform 5 rounds of alternate nostril breathing (get instructions here!) upon awakening and again before bed. This number can be increased overtime. Perform 15 minutes of restorative Yoga before bed such as legs up the wall, supported supta badhakonasana (reclined butterfly pose) and supported forward fold (Click here for detailed instructions of my favorite restorative Yoga postures). 5. Introduce a self-care practice into your daily life. Ayurvedic medicine is all about learning to love yourself by taking the time to care for yourself. Too often we become so busy caring for others we end up putting our own needs on the back-burner. Therefore a great way to welcome in an Ayurvedic lifestyle will be to make a little time for yourself each day by performing a nourishing self-care activity based on your own needs. Perform a self-oil massage (called abhyanga) each morning or before bed (click here for detailed instructions). Take a warm bath before bed (click here for our ginger detox bath recipe). Perform 30 minutes of gentle movement such as walking, biking, hiking or swimming. Take sometime to journal your thoughts, feelings or the days events. Spend 30 minutes on your own personal hobby (i.e. baking, reading, sports, playing music, drawing, painting or writing). Like the recommendation above, these self-care practices can vary each day. The most important aspect to consider is to make this “you-time” a part of your daily life. Even if you can only fit in a 10 minute walk, this is much better than nothing! Although one can get quite in depth with the multitude of rules and guidelines that make up Ayurveda, it does not have to be so complicated, especially in the beginning. By establishing these 5 simple guidelines (and being consistent with them!) one can begin to find balance, stability and health in their daily life. Making these shifts in your daily routine will undoubtably leave you with more energy, vitality and mental clarity. With the positive results that manifest, one will be more eager to continue on this healing journey known as Ayurveda, diving deeper into its vast array of knowledge, practices and theories.